Australian ice cream and beverage producer, Frosty Boy, has revealed what it thinks will be 2017’s biggest dessert trends. Felipe Demartini, General Manager of Sales and Marketing at Frosty Boy said desserts with the potential to “go viral” online are infiltrating the market. “The dessert market is constantly changing and being influenced by innovative ideas,” Demartini said. “2016 brought us a number of interesting dessert designs, while 2017 is set to explore even more ‘out there’ flavours,” he added. Conut – An ice cream cone made out of doughnut mixture, this dessert first emerged in 2016 but is likely to grow in 2017. This year will likely see even crazier and more decadent toppings added to conuts. Ice cream sandwiches with a twist – Similar to the conut, ice cream sandwiches with lots of decadent toppings and flavourings are expected to be popular. Miso flavour – This sweet-savoury tasting Japanese flavour is likely to make it into more deserts in 2017. Green tea flavour – Alongside miso, green tea flavoured desserts are also predicted to be popular in 2017. Demartini said last year saw the trend of ice cream cones made of doughnut mixture, or ‘conuts’ emerge. He believes this trend will continue to evolve in 2017. “Many of the contemporary trends are modern takes on classic desserts, creatively redesigned to satisfy the market. We expect this to continue to evolve in 2017,” he stated. When it comes to the emerging trend of quirkier flavours, like miso and green tea, Demartini said it is the Asian market driving the popularity of these new options. “Predominantly in the Asian market, the most adventurous or non-­likely flavours are building momentum. 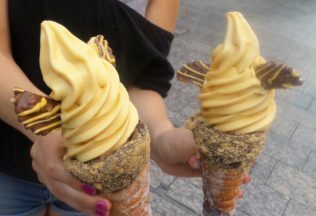 Ingredients flavouring soft serve include miso powder, soup or crunch as well as sakura, lychee, green apple, muscat and the most unlikely flavour of all, sardines,” Demartini said.